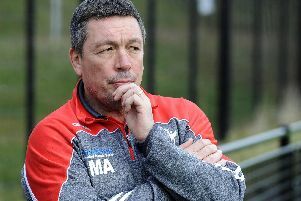 Sheffield Eagles made one stride forward during the Easter double-header, but Mark Aston will be desperate to avoid going two steps back ahead of a crucial clash with Swinton this Sunday. Aston, the Eagles director of rugby, will have enjoyed the euphoria of Good Friday’s first victory of the season against Rochdale, but the experienced coach only had two days to savour the moment as his side were beaten by Batley on Easter Monday. Despite the setback, Aston will have seen more than enough from the Easter games to suggest his side possess enough quality to beat basement club Swinton this weekend, in a game that looks to have huge significance for both sides. The Betfred Championship season may only be eight rounds old, but both the Eagles and Swinton will be conscious of not losing touch with those above, with a gap threatening to emerge from the bottom three sides. Winless Swinton bagged their first point of the campaign with a draw at Barrow on Monday, and are just a point behind the Eagles going into Sunday’s showdown. “Batley was a tough challenge and now we have Swinton coming up which is a massive game,” Aston informed The Telegraph. “We have to kick on now. We know that we are capable, we just need that little bit of consistency. Performances are a massive thing for us, that’s what builds the confidence. We want to go into this game with Swinton and come back with a little bit of space between us. That’s the challenge because they will also see it as a chance. “The Rochdale result has given us a base for progress. “Once you show and prove that you have the right mentality, then you know that you have it. It is just about bringing it out on a more consistent basis. We’ll keep working away on that. It has been a tough few months for the backroom staff but we taken some confidence out of what we have seen, and so have the players. The Eagles didn’t come through the Bank Holiday games unscathed, as Aston received another blow to his threadbare ranks. The Eagles chief is still attempting to plug the gap left by Cory Aston’s knee injury, but he is now coming to terms with losing versatile operator Nabil Djalout. The French international picked up what looked to be a serious injury in the victory over Rochdale, and after assessing the 29-year-old Aston’s fears look to be realised with the ex-Catalans ace set for a prolonged spell on the sidelines. Kick off this Sunday has been moved due to the Greater Manchester Marathon. It will now take place at 4.30pm at Heywood Road.